Judging by the debris you see drifting, yours isn't the first ship to fail out here. Sift through the debris, find what you need to survive, upgrade your suit, and ultimately call for help. Someone's got to hear you. Right? 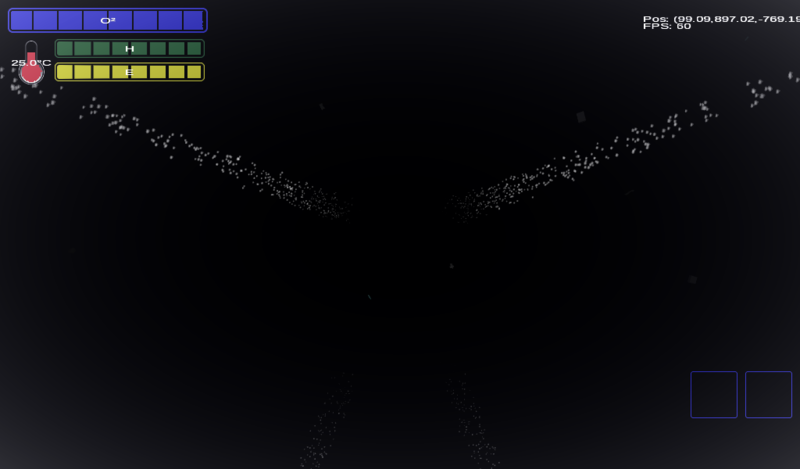 The Void requires OpenGL 3.3 or later. The Void is currently in (very) early access; less than half of the planned content is in, and gameplay from start to win is considerably quicker than it will be for final release (though, there's still a few hours of gameplay). 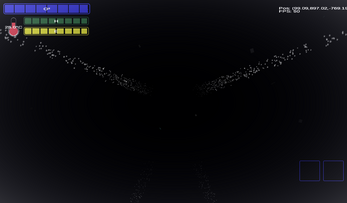 The Void has been coded with future multiplayer support in mind; so this will happen if there's interest. Base building is also planned for the future, and part of the code is already in place for this. 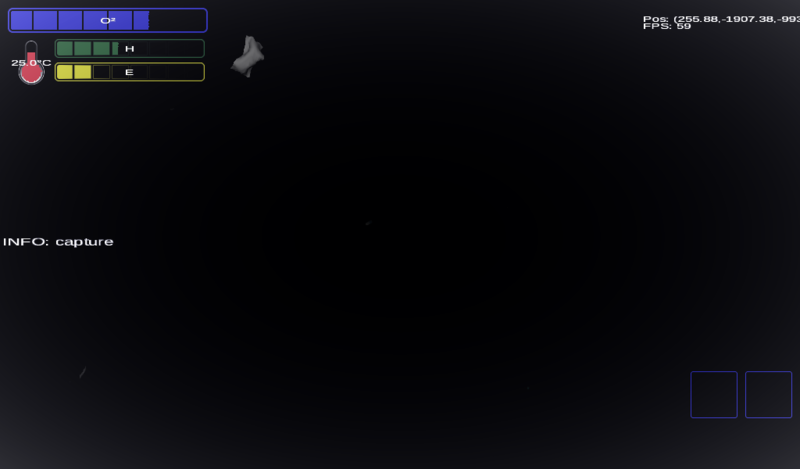 WADS+mouse for direction/movement - you are drifting in space, expect to have to adjust regularly! Left-click to pick up debris. G toggles external suit lights. Escape closes inventory if open, pauses game. Oxygen - you breathe this, also mixed with Hydrogen for drinking water. You get one canister on game start, additional canisters are found in debris, you can have two canisters connected to your suit for extended supply. Hydrogen - thruster fuel, movement uses it, also mixed with Oxygen for drinking water. You get one canister on game start, additional canisters are found in debris, you can have two canisters connected to your suit for extended supply. Energy - required for suit heating, lights, and hud upgrades. You get one cell on game start, additional cells can be found in debris, or crafted, you can have two cells connected to your suit for extended supply. Depleted cells can be crafted to neutral by adding biomatter, neutral cells can be charged by adding hydrogen. Emergency Stop will use about 5% of both energy and hydrogen to bring you to a total stop - use it wisely. 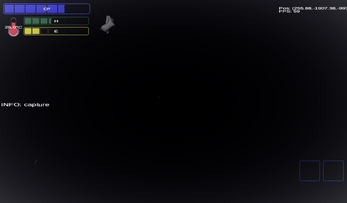 Your hud will flash warnings when resources are low or exhausted. Left-click picks up or puts down a whole stack of items. Right-click picks up half a stack, or puts down one single item. Shift+right-click will either use an item (if it has a usage), or craft an item when placing one item on top of another (tooltips display what can be crafted). 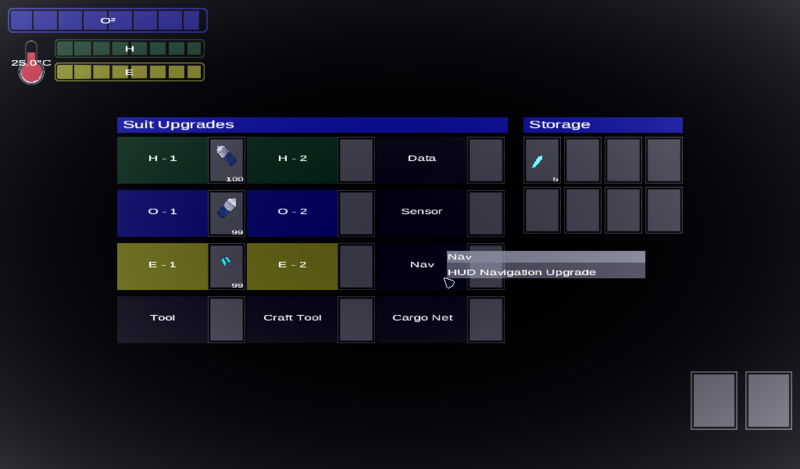 Ctrl+left-click will quick-move an item between inventory and its upgrade slot. Inventory size can be expanded by crafting cargo nets. Upgrades can be added and removed in the inventory screen, Tab to open/close. Tool - Not currently used, but will be for grapple hooks to improve debris collection, and building tools for base building. (Put Beacon in this slot to place it in the world). Craft Tool - Need for some high level crafts (you can't win the game without one). HUD Data - Control Crystal adds additional information to the HUD. HUD Sensor - Sensor Crystal adds bio-signs data (health, hunger, thirst) to the HUD. HUD Nav - Nav Crystal adds debris and beacon tracking to the HUD. Cargo Net - A small/medium/large/huge Cargo Net can be crafted and added to extend inventory size by 4/8/12/16 slots. Current win condition is to craft and place a Beacon, to signal for help. Once placed, you need to survive till a ship starts tracking the beacon (1-5 minutes), and then comes and rescues you (additional 1-5 minutes).